Unfortunately, this was a dud week for wax. Only one out these four waxes really worked for me this week. That being said, the one that did work is probably a new favorite. When I find a favorite it's dangerous because I want to buy that scent in every product possible! Let's get started. 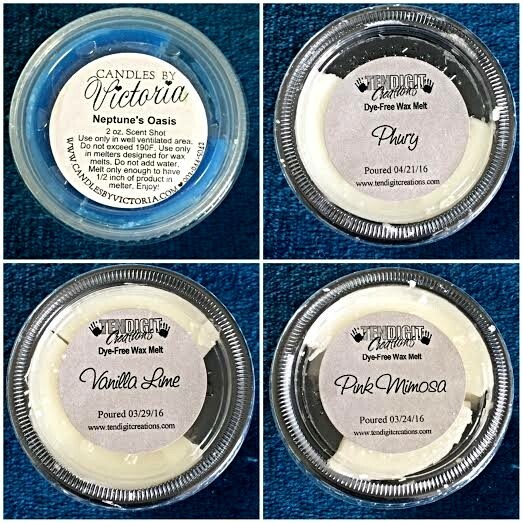 Scent Description: One of the most unique scents you will ever smell, this modernized version of a classic summer theme stimulates the senses with its freshness and vitality. The new botanical twist of an oceanic accord has dramatic tones of cactus with fresh green elements and unexpected texture. This vibrant green quality creates a shimmering top note that accents the fragrance signature of fresh sea spray. Unexpected salty accents add newness to the blend while elements of sea moss and warm driftwood create rich undertones that support the fragrance from within. My Thoughts: That's quite the description and that's exactly the problem with it. This is an issue I generally have with Candles by Victoria. There are just too many notes going on that it becomes muddled and muddy. I do detect those ocean and water notes, but whatever else is going on blends into some weird sweet syrupy smell. It's like ocean with a side of pancakes. Nope. My Thoughts: I really liked this scent for awhile. It's definitely men's cologne scent, but on the fresher and brighter scale. This one had a time frame for me. I liked it for the first hour or two and then it just became too much. It's not too strong of a throw, just the scent notes can are really sharp and be a bit nauseating after awhile. I feel like this needs some mellow note to dilute those harsher notes. My Thoughts: I'm always hesitant with vanilla notes. Sometimes vanilla can really round out a scent blend and at other times it overpowers it. The latter was the case with Vanilla Lime. I'd say this scent is 75% Vanilla 25% Lime. I wish it were the other way around or 50/50, but it is called Vanilla Lime not Lime Vanilla. It's a nice scent, it's just too much vanilla for me. My Thoughts: This is where vanilla in a scent works. This was my favorite melt of the week and I loved it. This reminds me a bit of Bath & Body Works Carried Away scent. They're not dupes. I compared them, but they have similarities. I detect the berry and citrus notes in this and it's all well rounded out with that vanilla rum. This has a very nice bright fruity yet perfumey vibe going on. I loved this scent and it will be one I'll be purchasing in bath and body products soon. I want to Pink Mimosa all the things! Pick Your Polish Blog Sale!